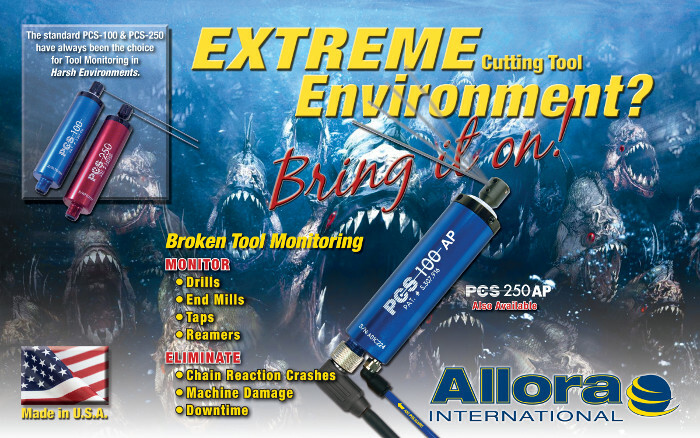 Allora International is the manufacturer of Positive Contact Sensors, tool monitoring devices recognized in the industry under the name PCS. Made in the U.S.A., our PCS-100 and PCS-250 sensors are simple, affordable and reliable broken tool detection systems, designed for use on automatic machine tools. Simplified, the PCS sensor is designed to check cylindrical shank tools such as drills, taps, reamers and end mills. Upon receiving a start input from the machine, the sensing needle swings to make a light physical contact with the tool tip. If contact is made, the machine will be allowed to continue. If the tool tip is broken, the sensing needle will swing past the tool, and the PCS will initiate a machine cycle stop signal. Our recently introduced Air Pressure (AP) version of the PCS sensors have been designed to withstand even harsher applications; the PCS-100-AP and PCS-250-AP have been designed for Extreme Cutting Tool Environments.